I’ll begin with a quick disclaimer. I’m fascinated by genetics. I even studied the subject at university and I’m a performing arts graduate so go figure – but a mild obsession with the subject doesn’t make me an expert. So please accept that the following review is somewhat informed, though by no means a scholarly critique of Dr. Margaret Smith and Sue Williams’ book Gene Genius. Let me also say there is a novel by the name of the Genius Gene so don’t get confused – this is a handbook to understanding, or perhaps more accurately unzipping, the magic of our double helix. It’s often assumed that the language of this subject replete with –ases and –sines is a put-off for most people, but it really is as simple as ATGC. Yep, that’s the alphabet of our DNA and fortunately the authors have a knack of explaining the subject material in an easy and accessible manner that will quickly enable you to reconfigure how you thought about your genetic material. This is a revolutionary area and it’s growing at a mind bogglingly exponential rate – but before you get caught up in thinking this book is already obsolete, take heart in the core of this text: our health (physical, mental and emotion) can be better understood by examining our genetic make-up and predispositions. Through a series of well-structured chapters both authors offer an in-depth understanding of how, despite your ‘hereditary history’ there is no reason to use the all-encompassing excuse ‘it’s in my genes’ as a copout – you can be an active agent in working with those sets of chromosomes you inherited from Ma and Pa. Admittedly, sometimes the chapters do come across as chunky sized soundbytes that deal with all the current issues the first world seems to be negotiating. Addictions, obesity, stress, environmental toxins the book does a good job of highlighting how we need to be more in conversation with our genetic roadcode before we drive off a cliff – and coincidentally blame it on a lack of decent brakes. But interestingly what seems missing is how the trillions of microorganisms who live in and on us react with our DNA in a myriad of ways. Our genetic material, as the authors affirm, is hardly static. Hormones flood our system, enzymes are catalysts for various chemical reactions and we are susceptible to a range of factors that affect our abilities and choices at both cognitive and emotional levels. Creating our ‘genetic roadmap to health and happiness’ as the authors promise is entirely possible, I’m just not convinced approaching it from a largely deficit model is the best choice. However, it is easy go-to manual. If you do wonder why you’re more prone to anxiety when pressure increases or if highly stressful situations encourage you to over-eat; or even if you’re wondering how to navigate the varied forms and effects of depression then this is a handy guide. It also strongly encourages exercise and healthy eating and does question the tendency to over-indulge on vitamins and supplements, a valid and important issue considering each individuals DNA is unique. One of the reasons this subject has always caught my attention is the marvellous beauty of genetics and if anything, this text misses out on including some stunning imagery – however, what it lacks in visuals it does make up in anecdotal narratives and for the most part, plain and simple language. It’s written largely for an Australian audience with a good collection of international references. These locate it within the larger global landscape making it an excellent starter to whet one’s appetite on the subject of your genes. 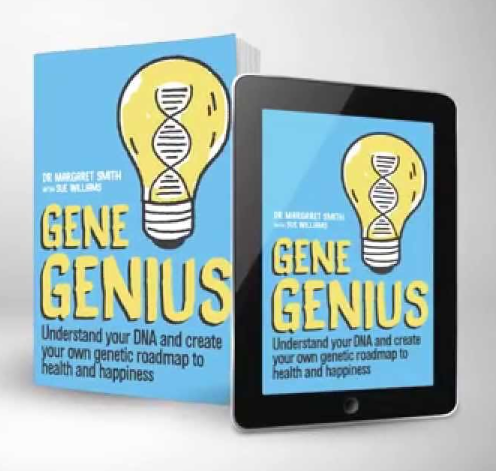 If you want to learn more about your own blueprint the Gene Genius is a solid start to unlocking the code of who you really are at a genetic level.